Good on you Jang about the millennium falcon. I hear you! It is a fantasy kinda set! It is fan-tastic that it exists at all! It also for those ultra enthusiasts of the hobby also for the other side of the track sellers that are in it for the money! Also, money is money and we gotta use it for better things!! I live in BC Canada, and my closest Lego store was supposed to get 8 sets, but was able to get 20. I was there more than 2 hours early, but still wasn't able to get one. I am impressed that they were able to get so many, but still sad I missed out. Sounds entirely sensible to me. Wow, I am surprised to hear this from the (I think) largest Lego reviewer on YouTube... not thinking of getting the new UCS Falcon?!? Seriously?!? To what seems like many this is like your job, but not to mention many would count on a good review from Mr. Jangbricks to give this set. I know there are alot of Lego sets out there already but I would say to forego some of them (which many are redundant) and focus on the UCS Falcon which is sure a special set that does not come around too often. If you don't want to keep it fine, then just take it apart and sell it off. Its his own opinion to buy the set. Dont get angry. Respect the decision. As for taking apart bricks, its not as simple as you thought to remove 7541 pieces. Building is 2 days. Removing it, 1 day with your fingers pain as hell. :) have a great day. 1. He doesn't resell sets after reviewing them so he would be out the full cost of the set. 2. He has to look at the question "Would the set generate more income than it costs?" in both cash and time. 3. You say he should forgo redundant sets, I would think that the fourth full size Millennium Falcon set in 10 years would be redundant. 4. If he had gotten the set on the 14th the review wouldn't have come out till the 18th-20th. By then anyone waiting for his review to help them decide could not buy it because it is sold out. Sorry but the comment is right on. A lot of people look to the all mighty Jang to do reviews on these special sets. For him to blow it off is inconceivable. Do you think just because he has this little link it is going to stop the scores of people who will bug him about "where is the Falcon review" comments? He will be bugged to no end. My wife and I were peripherally excited to get this set (we bought, built, and still enjoy displaying our UCS Super Star Destroyer) but as soon as we heard the price (and imagined the difficulty in getting one reliably) we pumped the brakes pretty hard ourselves. I'm quite content to look at the lovely pictures abounding everywhere these days. In other words, I think we at least perfectly understand and commend your decision. That said, if you happen to pick one up eventually, we'll be first in line to watch your video(s) of it! I say take the 900$ you'd have to spend on that hunk of plastic, and buy stuff for New Jang City that will make you TRULY happy. Although I'm disappointed that there won't be a review for the set on your channel (you're basically the best LEGO reviewer out there), I'm glad that you're not buying what would basically amount to an item that would just end serving the purpose for a single video and not much else. As for myself, I already placed my order. It's definitely the most accurate version of my favorite ship in pop culture period, is highly detailed, does everything I want it to do, and although the price is ludicrous, I thought it was worth the set in question. But that's just what this Falcon means to me. I hope you spend what would've gone into the ship on something that's a whole lot more important to you. Maybe another skyscraper in New Jang City? Jang! Just to make a bit of fun on this ;P here in London there were 150 box of the new falcon available on the official event Wednesday midnight in Lego Store Leicester Sq. You should have come!! ;) Anyways I understand you are upset a bit missing out this time but please get it somehow and do an epic review for us!! Believe me however your review wouldn't be the first out on YouTube but certainly would be the BEST of all!! You are rock!! Please don't be afraid sharing an extended version of the review I don't mind watching even if it's gonna be an hour an a half long lol! Have a good one!! I see your point Jang, and I feel the same towards some of the other smaller, less expensive sets as well, if you don't like them to begin with, you don't have to force yourself to buy it just to make a video review. I rather see you spending money to buy parts to build your Jang city, which is more interesting than seeing you build a LEGO designed set. I understand your point, if you are not interested and don't want it then there's no point in spending all that money. That said it's really a big loss for the Lego world, your reviews are by far the best ones you can find anywhere. I watch all your videos, even the ones about sets I don't care, because you are blessed with a magic touch for these things. I'll keep hoping Lego itself will send you a copy. I'd do it myself if a was a bit richer and lived closer to you. My first though when Lego revealed it was "wow, a new great review by Jang!". Part of his rules as an impartial reviewer is that he only reviews sets he has gotten through retail, so if someone sent him a Millennium Falcon set he couldn't review it. I know. Still I hope. He appreciated the Lego box (the one with Mini iPad — loved his reaction on iPad) I'm sure he could appreciate this too. And, if he doesn't want to keep he can give for charity or so, as he usually does. But at least he wouldn't have the stress of finding and paying it. That's a bummer. I'm surprised that Lego didn't send him one to do with what he pleases. Either way, keep making such great content on youtube, thank you! For the same amount of money I had to pay for the Falcon I could get me the Ninjago City modular building, the Ghostbusters Fire Brigade and the next modular building. Easily 3000 more parts, more value for my money and more fun building the sets. I am glad to own 9 modular buildings at this point, 10 if I count the Haunted Mansion. I once bricklinked the first USC Falcon and found the building experience to be more of a tedious work than a fun hobby time. But that's just me. Dear Jang, I do not especially care of the new UCS Millenium Falcon and I fully understand your decision (even though it makes no difference since your decision is not up for debate), but your argument as a flaw: you say "one of 30 or 40 UCS Falcon YouTube reviews (all showing the exact same things)", however, your reviews are really different and, no, do not show the exact same thingy as the others. Go on reviewing what you like, because you are doing a really good job. Your sincerity is your super power! This is the Internet, you're not supposed to have a sense of proportion! More seriously- I actually find your reviews of small-to-medium sets more useful. There are far fewer other reviews of such sets out there, and less official promotion of them. I've not got the hugest budget for Lego, so your reviews give me a very good idea of which sets are worth it for me. I totally understand your decision on not buying the set now. It is so expensive, and if the idea was to just get it to say you have built it and then do a review then your money is better spent on other things. I am debating getting one or not myself. I do like Star Wars (not a Die hard, just regular fan) and I do have some other UCS ships, but it will have to wait until it is released to stores if I have the money when that happens. I also want to get the Ninjago City and Old Fishing Store, so I will see what I'll do. That's the reassurance I needed Jang. Even though I have the ca$h to buy the set (and a few more) I can personally do a lot of things with the $$$ (Ninjago City and Old Fishing Store take priority to me aside from personal expenses such as saving to buy and build a house). I will continue to buy Lego and will make a table or two for a Plastic Army Men battlefield (the classic tan vs green) in the new house after making enough living space for me and for more if the need arrives. Thanks for opening my eyes and continue with your videos. Do you recommend some RC tanks that can go well along the Army Men battles? Jang, I completely understand! It's big, it's expensive, and it's Star Wars -- those are really the only factors that will be influencing people's decision to buy this set. The amount of resources that you would invest into this review is enormous, and the raw utility of the video to viewers would be low. I myself would greatly enjoy watching you review this set for entertainment value, but I highly doubt that it would sway me to purchase it. Either way, thank you for making the thousands of other videos for us to enjoy! I hope you have a great day. I think everyone has to be careful with money and the amount that the UCS MF is being sold is most definitely not cheap! So if you are not completely 100% sure on whether you want it - it's a lot of money to blow on it! I'm with others who are surprised that Lego don't supply sets to you for review occasionally as I'm always struck by your integrity in your reviews. You are the best Youtuber, if that's a word! Keep up the good work! Jang is soooo right. I can get Ninjango City, Disney Castle (licensed), Arkham Asylum (licensed) for 350 + 400 + 144 = 894 CDN...that over 10,500 parts for the same price as the falcon...how can lego justify this price??? That's not fair. The price after all is honest, at least aligned with other set. The difference is just the amount of plastic used. This post hits home for me. It makes so much sense as a big LEGO blogger. Not letting the hype get to you and force you to purchase a set you don't truly want. I wasn't able to get mine through the website (https://youtu.be/TdfuQ16Qkho) Love your content. Thanks for a fresh true post! On one hand, good on you for making people feel better about not buying the set for themselves. On the other hand, shame on you for not providing a review for those who like to experience sets vicariously through your reviews. Again, why exactly? Because it's too hard? Because you don't have a long term place to display it? That makes sense for the average person, but not for someone who has 800k subscribers when talking about a truly epic set. Frankly, the whole post reads that you are butthurt about not being recognized as a "Lego sponsored media outlet." That isn't fair as well. We may be sad not to get a potential fantastical review. But the really good thing of Jang is that he makes his video out of passion, and not as a money maker. "Frankly, the whole post reads that you are butthurt about not being recognized as a "Lego sponsored media outlet.""" - WHAT?? a) A lot of people watch your content because you are doing it. I'm not going to buy a Lego Friends, Nexo Knights or Ninjago set, but I enjoy watching you review it. b) For stuff I'm interested to buy, I usually want to see your reviews specifically, because I find them more informative than other reviews out there. c) Given how few people actually were able to buy the Falcon, and will be able for a while, and how long it will be on the market long-term, your review would still be relevant even if it came out a couple of weeks later. I always love your reviews and was looking forward to it, but I think you're 100% making the right call. Good on you! I honestly did not think you could do another thing to make me respect you more but once again you have out done yourself Sir! I applaude your decision. Good decision! Sensible and absolutely understandble. Totally fair and rational reasoning. Nobody has any right to begrudge you for passing on this set. As you said, there are already several reviews available, all of which cover the exact same things, and countless more are to come. Adding one more review to the mix would be practically pointless. I I fully understand your reasons for not buying it. Not only is the price astronomical, but it's truly just a diehard fan set to purchase. I myself have had to think twice about investing it this, not only for the price but also for any place to display it. That being said, and I'm sure I will offend some people, I personally think that it it isnt that great of a set. The cockpit is too small, the interior sections are too small (in relation to the movies), and the gunners turrets are a joke at best. For something of this scale I feel that the designers could have done a much better job. 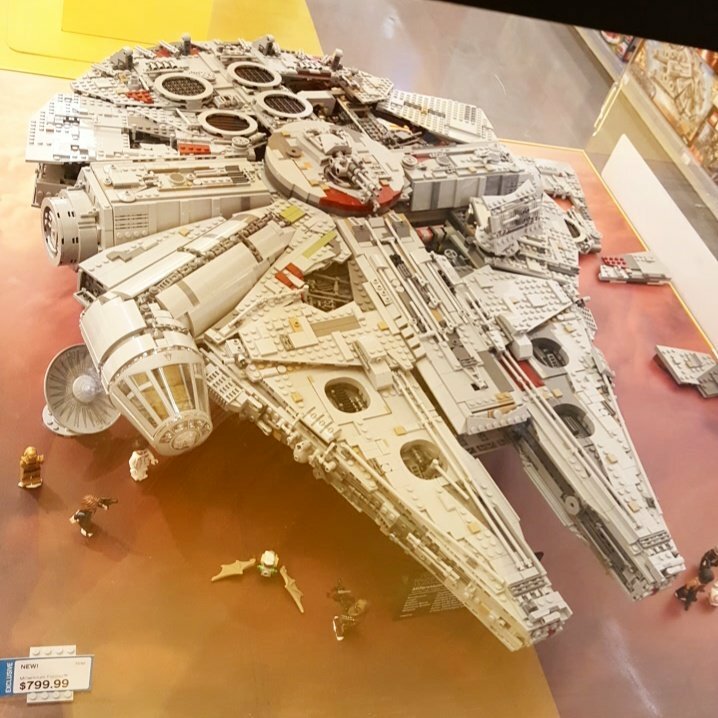 After seeing people that have done full interiors with the first UCS Falcon it seems more than a little bit of a let down when TLG released the new version. I personally have decided to apply my resources more intelligently and purchase multiple sets that will ultimately put me closer to my building goals. So hats off to you for injecting a bit of common sense in this debate. I understand your reasoning Jang, to an extent. Thing is though, I don't watch other reviews of Lego on YouTube, I only watch yours. And even though I understand your reasoning, I am also quite disappointed that I won't be seeing a review of the biggest Lego set ever by the best Lego YouTuber ever. So I for one will be hoping that you will do it at some point. Not sure I can add anything more than what has already been stated. Jang, you are unequivocally the best Lego blogger and the one and only I seek when new sets come to the market. Even if you decide to take the plunge a year from now, we will all watch with glee. Keep up the great work! This, like a nice painting, will be with you for all your life. As much as i wanted to see a review especially from you, i fully understand your reasoning. But it would have been great to see you reviewing it. Failing to plan is the same as planning to fail. No way an experienced LEGO buyer would show up at the time the store opens, or even 1-2 hours early, with any real expectation of going home with a new exclusive set. Had Jang really wanted the new falcon he would have showed up more than a "few" hours early and gone home with one. I believe his decision was made days before release, perhaps even subconsciously, and his lackadaisical effort to buy one shows that. I support Jangs decision to not get 75192 (although I think he's wrong), and his reasoning can stand up to our scrutiny, even (especially) without his weak "I tried" accounting. IMHO, he needs to make this up to his loyal followers by trying again on Oct 1st and succeeding this time. Yes! I'm really glad you didn't get this set. There are already so many other reviews of it, so I was secretly hoping you wouldn't get it and instead spend that time building up New Jang City! THANK YOU! You are probably the first AFOL I have heard who has said "I don't want it!" Good for you!!! Absolutely respectable Jang. I will say that if you DO get it, the issues with you find with the cost, the size, and the time will likely be resolved. Especially when you slap the specs sticker on that tile, take a step back, and see what you just completed. I can't stop looking at mine, its just SO impressive. Not even Jang could make this topic innovative or interesting for me anymore. With it being the top few and most recent stories of most brick blogs I am personally sick of hearing about it. This is not even about the money for me. This guy owes nothing to anyone here. All content is a bonus and much appreciated. Good for you, Jang! I'm saying no to this set for many of the same reasons as you. But I wonder with you bringing Hasbro sets in for a compare/contrast AND not getting the UCS Falcon, perhaps LEGO miscalculated their heavy-handed cease and desist order regarding the newest Star Wars wave and royally honked off arguably the most influential Lego reviewer on the 'Tube? I wouldn't blame you if that were the case. You've done a lot for that company in terms of getting people enthused and involved in the hobby and then to be treated so callously. I mean they threatened everything that you have worked so hard to achieve because you posted a review! It serves them right that you should highlight other companies' products and point out their higher value compared to the LEGO versions. Perhaps innovation on the part of other toy companies is part of the reason for LEGO's profit loss this quarter. LEGO needs to pull it's head out of it's anti-stud and recognize the fans, young and old, that make it a success, not threaten them. Whilst I have no problem with your decision on this set, I feel as though I have to mention that as a British Afol, for some reason, we have been dealt better cards this time. The London Store opened from Micnight until 1am on VIP release day, with a signing by the 2 set designers. They had 150 (One Hundred and fifty) sets for sale. I live in Manchester, UK, and after seeing all of the online reports about lack of stock, I decided to go to my local store an hour before opening time, of 9am. I arrived to find a queue of 12 people in front of me. That was at about 07.50am. By 08.45, 15 minutes before opening, the 28 sets available had been allocated 1 per customer by the Manager, attending the queue outside the store. I was informed by the manager that the store had had 12 sets delivered 3 days prior, and a second delivery of another 16 sets the afternoon before. They are delivered from Lego on pallets of 4. So how your local stores had just 3 for sale, makes me think the 4th has been sold privately or for a staff member or something. I have since found ot that most of the UK stores had between 12 and 40 sets on VIP release day. Go figure. And I agree with what you're all thinking, this is NOT fare!!! Jang, your arguments makes sense (not that you need my/our approval, of course). At first I was like, "What?!" But, the points you make are reasonable and a good "cost-to-benefit" analysis (beyond the monetary costs involved in obtaining the UCS Falcon). And as it turns out you fell ill about the same time-frame as this period you speak of, so "it's all good." You are role-modeling a practical attitude that all LEGO fans can apply in their lives, less the fanaticism drive them to ill health or bankruptcy (extreme, but possible; I've seen it). This is my first comment here -- I watch YouTube on TV streaming devices and those don't allow for comments, so my comments on YouTube and Facebook have been rare -- I'm glad to subscribe to your blog now too. It is a shame as yours is the review I wanted to see on it. I get your reasons and they're entirely fair and reasonable but I'm still gutted. It's a shame you can't borrow sets to review. You could always store it like many people will be doing and hope to make a profit once it retires... No! Fair enough, it was worth a try. As always, I look forward to your reviews. Fair enough, no point wasting good money on an over priced set. While I would of liked to have seen your review, it was more just to see how different it was to the last, and to further drive home how utterly terrible it is a set, by a children's toy company, as they like to claim. Honestly it's a children's toy right? $900 for a children's toy? "It sits there and opens up, and a few things rotates, oh but don't drop it, it took two days to build!" But seriously this is probably one of the worst sets Lego could have released, we don't need another one, there was one just one or two years ago and that's still on shelves, for much less and is a much better toy. Ah, Lego taking a page out of Nintendo's book on highly anticipated releases! Ah, Lego taking a page out of Nintendo's book on a highly anticipated/demanded release! You are a wise man. Love watching you make your city! Hoping to kick off my own Lego Hobby obsession blog in the next few weeks. Look forward to sharing ideas with you! P.S. I think sets like Destiny's Bounty and Ninjago City are much better buys and heaps more fun (got both of them as part of my starter content). My kids love them, so hoping can do some stop motion with them too. What a great hobby for them too! Keep up the awesome work. P.S. You are not popular with my wife currently for encouraging my love of the brick! Your reasoning is flawless, Jang. When 75192 was announced, I NEEDED it; I've been putting aside £100 a month into a slush fund to fund it. But... when it came to clicking Complete Purchase during double VIP points earlier this month, I hesitated; I don't need it, and have no room for it. So, the money will be going to Bricklink sellers to build a city! Sorry but I think Jang is being very lame with this. Obviously got kilometers of room for tens of thousands of dollars worth of LEGO, and he refuses to buy this. Sounds like he just got annoyed because he couldn't buy it when he wanted to. Seems a bit strange that he wouldn't want to own this. Anyway, who cares. That's my judgemental rant. What I like of Jang is that he does things for passion, not money. I rather prefer not to have a review of a set I love (and own) than an heartless one. Could he buy it? Sure. Would he like to buy it? No.